Dadgummit ($16.95, 248 pages, ISBN: 978-1-60381-593-2), is the latest paranormal cozy mystery by Maggie Toussaint. While on vacation in the Georgia mountains, amateur sleuth and psychic Baxley Powell joins forces with a local Native American detective to stop a voracious supernatural being on a killing spree. Wholesale customers, contact Epicenter Press/Aftershocks Media: orders@epicenter press.com. 5 Stars: “The author draws from myth and legend and her boundless imagination to create a wonderful story. Dadgummit keeps the reader engrossed throughout each page with surprising plot twists and the author’s unique take on the paranormal genre. Highly recommended for both fans of paranormal and for those readers who just like a great story!” Read more…. “Dadgummit is a solid and fascinatingly eerie mystery that tingled my spine and had me sleeping with the lights on. I didn’t want to put it down! While it’s a fantastic follow-up to the author’s outstanding previous releases, the backstory is so expertly woven into this new release that the book stands on its own as an exciting, enticing and thoroughly entertaining read.” Read more…. 5 Stars: “From the very first page, I was drawn in by the powerful prose, the tight sentences, the images, and the way [Toussaint] blends the consciousness of the characters with plot and setting. The characters are unique and original, and their extraordinary gifts make them even more interesting. I loved Baxley and her dreamwalking gift and how this gift plays a central role in her investigation. The plot is tight, well developed, and well paced to keep the reader turning the pages. 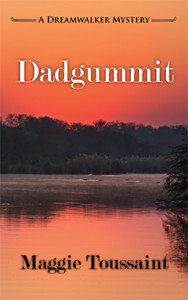 Dadgummit is a rare story that will have readers completely engrossed in the plot and in the characters.” Read more…. “Dadgummit is such a wild, exhilarating, and thrilling ride! I was drawn into Baxley’s world from the first chapter, and there I stayed until the very last page. I’m impressed by the complexity of the mystery [….] Dadgummit is un-put-down-able! Not that I’m complaining—I’ve been eager to read it ever since I finished Doggone It. I just love Baxley Powell and the Dreamwalker Mysteries! I can’t wait for Book #5.” Read more…. “Maggie Toussaint has an extraordinary imagination and I can’t help but follow her with mine right into this story [….] The way the author made these other worlds come to life is really unique. The dialogue was so well written. The plot has some surprising twists and very fearful moments. This story is sure to be a hit among paranormal/supernatural fans.” Read more…. “I’m Sheriff Twilla Sue Blair. You’re the psychic?” the sheriff asked in a green-apple-tart voice. “Sometimes.” And sometimes I talk with them, but that isn’t the norm. My jaw clenched. If she expected me to perform a public séance, she’d gotten the wrong message from Wayne back home. Maybe if I pointed out her error, she’d let me off the hook. I didn’t want to be interested, but I was. My tattoos heated a bit. An entity from the Other Side named Rose had marked me with two inked images of her namesake flower, one for every favor she’d done for me. My debt to her was an hour of my life for each tattoo, which scared the bejeebers out of me. According to Rose, she was an angel working an undercover assignment in the netherworld. I’d witnessed her black wings and her unusual powers firsthand. Since she’d tagged me as hers, I hoped like anything she was telling the truth. Unfortunately, my lie-detecting ability didn’t work on Rose, so I had no choice but to do her bidding. I glanced around, hoping this tattooed mentor and sometime nemesis wouldn’t draw me into a dreamwalk right now. Rose had rescued my father and saved my mother’s best friend, and now I owed her two hours of my life—a fact she liked to dangle over my head.